Today on the blog I have been joined by the lovely Aoife Walsh, author of Look After Me and Too Close To Home as part of the YA Shot blog tour. Click on the book image to get to Goodreads. Aoife Walsh lives in Oxford with her husband and three children. She quite likes cooking, and quizzes when she knows the answers, and reading, and excellent American television. And cakes and fine wines. I used to write a lot when I was a kid, but I gave it up when I was about fourteen or fifteen and wanted to spend more time thinking about myself. About nine years ago I had two dreadful small children and needed to get out of the house, so I signed up for a Creative Writing evening course – and that got me going again. What’s your favourite thing about being a writer? There are so many fantastic things. We all seem to spend a lot of time on Twitter asking each other why we do it and it’s true, the pay is crap and it’s hard a lot of the time because I don’t really get any time off now. I mean, none. If nobody else is in the house or I’m not playing Uno or cooking food, I’m supposed to have my nose to the keyboard. However, nothing beats the act of creation. You don’t get that feeling all the time but when you do, it’s beautiful. Also, I get to work in my own house without wearing makeup or hurty shoes or having to drink tea with full-fat milk in it. In Too Close To Home and Look After Me you write about complex families. What inspired you to write these books? I’m not sure I can even imagine writing a book which isn’t intrinsically about family. That doesn’t have to mean parents-and-their-children, of course. The fluidity – or otherwise – of family borders and the harshness and safeness of family relationships are a big old area for me and my books to float about in. Also, I think it can be a vitally important issue for young people who may or may not feel at home in their own families but who can’t, generally, escape them yet; and who may be changing and growing out of their old roles within the family. Or not. You see what I mean, there’s a lot of space. Do you see yourself or your loved ones in any of the characters you have created? Ahem. Yes. Too Close To Home came in lots of ways out of my two eldest children, though they’re still much younger than my characters. Also, Minny has a fair amount of 14-year-old me in her – her more or less constant exasperation with everyone around her, for instance. Weirdly, my brother seems to work his way into everything I write. I wouldn’t tell him that, he already thinks he’s terribly important – but Adam in my first book was quite a lot like him; Minny has a bit of him and so does her bossy dad. Minny from Too Close To Home loves English. What was your favourite subject at school? English. Predictable. I loved Latin too, though, and I ended up doing History at university. I loved the reference to literature in Too Close To Home. I love reading about characters who love books as much as I do. Who is your favourite book loving character? This is a madly tricky and brilliant question. So many characters love books, and so many evil ones don’t – Matilda’s father ripping up her library book, and poor little Jane Eyre, getting her book thrown at her. Probably my most favourite characters are the ones I didn’t feel were more highbrow than me – I was always a bit intimidated by Sara Crewe with her flawless French and interest in history at the age of seven – she was like the 19th century version of Rory Gilmore. I love Francie Nolan from A Tree Grows in Brooklyn, and Emily of New Moon, and Beezus Quimby and, it goes without saying, Hermione Granger. Have you always been a reader? Yes. I always have been. I remember as a kid wondering with awe and horror what people who didn’t read did with their time (I could understand it more these days, what with all the different Real Housewives options). Do you prefer to read a ‘real’ book or an e-book? I hope this doesn’t sound like I’m trying to be kooky, but I’ve never read an e-book. Not even a page of one. On the whole I feel pretty okay about sticking to ‘real’ books; I spend enough time looking at a screen while I’m writing, and I’d be afraid of dropping it in the sink while I was washing up. Besides – actual books are better. Libraries have always been one of my favourite bookish places. Have you got any memorable experiences at a library? I used to love my local library, mostly because they had an inexplicably brilliant selection of Astrid Lindgren books which were ungettable anywhere else – not just Pippi Longstocking but Karlson On The Roof and The Bullerby Children and Emil and Lotta and best of all, The Brothers Lionheart. My school library was great too, it had The Outsiders and the Alanna books and a ton of Cynthia Voigt, all of which changed my life; but I think other people’s – fictional people’s actual library experiences – stick with me more clearly than my own. Anastasia Krupnik and her obsession with the early symptoms of leprosy, Francie Nolan reading a book a day, all through the alphabet, and only allowing herself a children’s book on Saturdays – and her unsympathetic librarian. Who is the worst librarian, Francie’s – or Jessica Vye’s, who in A Long Way From Verona wrests Jude The Obscure from Jessica’s hands and replaces it with an awful ‘velvety-looking, thin sort of book’? Or Adrian Mole, re-shelving Jane Austen among the light romance novels? And who is the best – probably the marvellous Mrs Phelps in Matilda, or else Miss Laburnum in The Librarian and The Robbers, who ends up almost crushed beneath her books? There is a memorable library experience for you. Do you think libraries are evolving with the growing popularity of e-books? I don’t know enough to answer this question, except by saying that everything I see about libraries suggests to me that they are run by people who love books and who expect to be able to get almost any information about anything from books – and who are therefore massively qualified to make their libraries do anything that library-goers need them to. It seems to me that the only threat they face has nothing to do with books or e-books; it’s from politicians who either do not understand their importance or who are still afraid of the possibly revolutionary impact that books can have on people who can’t afford to buy them. Currently reading? The Complete Stories of Flannery O’Connor. Book you wish you had written? Gilead by Marilynne Robinson. Favourite place to write? At my desk, in my sitting room, with work-related books (and the rest) piled up next to me and a map or two to look at on the wall. Favourite author? SO HARD. Astrid Lindgren. Fictional character you love to hate? Maybe Mrs Elton from Emma, or else Robbie from Dirty Dancing (can I have that?) – what he does to Penny is disgusting enough, but when he hands Baby a copy of The Fountainhead and says, ‘I think you’ll enjoy it, but make sure you return it; I have notes in the margin’ – what a giant, giant idiot. 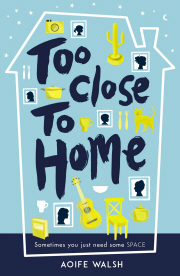 My review of Aoife’s recent book Too Close To Home will be coming tomorrow! Nothing in life is free. Turns out, nothing in the afterlife is, either. When recently-deceased Irene Dunphy decided to “follow the light,” she thought she’d end up in Heaven or Hell and her journey would be over. Boy, was she wrong. She soon finds that “the other side” isn’t a final destination but a kind of purgatory where billions of spirits are stuck, with no way to move forward or back. Even worse, deranged phantoms known as “Hungry Ghosts” stalk the dead, intent on destroying them. The only way out is for Irene to forget her life on earth—including the boy who risked everything to help her cross over—which she’s not about to do.As Irene desperately searches for an alternative, help unexpectedly comes in the unlikeliest of forms: a twelfth-century Spanish knight and a nineteenth-century American cowboy. Even more surprising, one offers a chance for redemption; the other, love. Unfortunately, she won’t be able to have either if she can’t find a way to escape the hellish limbo where they’re all trapped. I’m so happy to be here today, thank you so much for inviting me, Chrissi! I actually met Chrissi through Top Ten Tuesday when we started commenting on each other’s posts and I’m a regular reader of her blog, so it’s an honor for me to be here today. I’ve always written; in grade school, they had us write a story every year, which we then made into a book – we printed it neatly on nice paper, drew pictures to accompany the story, and then sewed it all together with a cardboard wrapped in wall paper for covers. I think that was my favorite thing we did all year and I still have those stories (thanks Mom for keeping them!). It wasn’t until 2001, however, that I really set out to write a novel “for real,” and that’s when I started working steadily toward becoming a professional author. What inspired you to write Hereafter and Thereafter? The idea for the Afterlife Series came to me one day while I was driving (as so many ideas do); I thought about how different all the stories are of what happens to us when we die. If all the stories stem from some common story or belief what might that original story look like? How could we reconcile all these different “truths” about what happens, and all the various superstitions related to ghosts and how to bury the dead and such, and what would the afterlife look like if all the stories were true in some way? Around the same time, the character of Irene came to me—a strong-headed, complex woman who isn’t really good or bad and who is just sort of treading water in life—and her struggle to deal with her early/unexpected death. The two ideas came together and Hereafter was born. Can you see yourself in any of the characters? LOL – well, none of the characters are “me” per se, but a lot of Jonah’s depression is pulled from my own memories and experiences as a teen. Whenever I hear someone say they wish they could “go back” to being a teen/kid and do it all again, I think, “NO.WAY.” I would never go back—being a teen was awful! Both books come across as very well researched about the afterlife. Did you have to research quite a bit or have you always had an interest in it? I love mythology, especially the origins of myths. Throughout history, cultures borrowed from each other, building on each other’s mythology and stories. If you go back far enough, you can find the common origins of those stories—that’s the stuff I find really fascinating. When I came up with the idea for Hereafter, I thought about all the stories/myths related to what happens to us when we die that are out there, and how different they all are and I wondered what the common, underlying story(ies) were—what were the common, unifying threads? And to take it one step further, if all the stories were true, how could they be reconciled? That was the challenge I set up for myself with this series: to create a cohesive vision of the afterlife that included ALL of the myths from every culture and religion on Earth from throughout all of history. So the research has been quite extensive and incredibly interesting; I have a giant three-ring binder full of my research and I’ve worked as much of it as I can into the series. If Hereafter and Thereafter were made into movies, who would you cast as Irene? This is a really tough question, actually! For three years now, ever since Hereafter was first published, I’ve been racking my brain, trying to come up with an actress to play Irene. It’s tough. I think I’d have to go with an unknown because I don’t know of anyone who fits the bill. Alison Scagliotti might be perfect if she was just a little older (Irene is 36). Jaime Murray and Alicia Coppola would be almost perfect (the right mix of sweet and snarky) but they are a little too mature—and I don’t mean to say that they’re too old; I mean, when you look at their faces and in their eyes, they are mature, grown-up, thoughtful women. Irene is very immature. You’d never mistake her for someone’s mother or someone who could be maternal. I don’t know—readers, what do you think? Any suggestions on who should play Irene? What’s your favourite scene in Thereafter and why? There’s a couple of scenes that I really like, for different reasons. I LOVE LOVE LOVE the creation of the horse because I feel very clever for making the Chinese myth of burning paper items to send them to the dead true/literal and because…HORSE! Can you think of a WORSE traveling companion for Irene than a horse? Writing Irene’s reaction to the horse was a lot of fun. I love the initial letters from Jonah to Irene because of what he doesn’t say. In Hereafter and Thereafter, Jonah is a bit of an iceberg in that most of what’s going on with him is below the surface. He doesn’t give up how he’s feeling very easily and the reader has to work for it a bit. Spoiler alert but that changes in Book #3. And finally, I really love the scene where Andras comforts Irene outside the hotel. I thought I managed to hit just the right tone with how Andras responds to Irene’s distress and how Irene responds to him. What’s next for you writing wise? I’m working on finishing up Book #3 of the series (there will be six books total) and I’m working on a science fiction story that’s sort of Firefly meets Battlestar Galatica—that is, cowboys in space who must look for a new home when theirs is destroyed. Currently reading? : Weight of Worlds by Alma Alexander (short story collection) and re-reading Federica by Georgette Heyer. Favourite author? : I have to pick just one?! That’s a toughie, but I have to say Terry Pratchett—if I see his name on a book I buy it, even if I don’t know what it’s about. Favourite place to write? : I imagine out story lines in the shower and car, but I jot notes anywhere I am (I keep a notebook on me). I do most of my typing on my laptop while sitting on the couch in the living room. Favourite fictional character? :Ooooh, another toughie! Hmmm…I don’t know. I don’t think I can pick just one. Possibly Lord Vetinari from Terry Pratchett’s Discworld Books. Book you wish you had written? : The Night Circus; the writing was really gorgeous in that book. I wish I could write that lyrically. Today I am joined on the blog by the lovely Denise Deegan, author of The Butterfly Novels which I have reviewed over the last three days. If you haven’t read my reviews and want to, please click on the image of the book. What inspired you to write The Butterfly Novels? I hadn’t planned to write for teenagers. I had finished a two-book deal with Penguin for contemporary books for adults. An artist friend and I decided that we’d like to work together on a picture book for small children. We met in a coffee shop and brainstormed. One of our ideas was for a book featuring a dad who would go abroad to work, come home and tell his little girl about the country he had visited. We both decided that it was too politically correct and boring. My friend went to the loo. While she was gone, this voice came into my head. It was a teenage girl giving out to her dad. She was so angry and sarcastic but underneath it all there was a huge vulnerability. I didn’t know where it would take me- whether it would be a short story, a novel or nothing at all. As I was not under contract and I wanted to have fun, I decided to listen to the voice and see where it took me. It came to me that this girl’s name was Alex. The reason she was angry with her dad was because she had lost her mother to cancer six months previously and her father had not been there for her physically or emotionally. I realized then that the whole idea for the novel had come from my subconscious. It was reacting to the picture book idea and telling me that it’s not necessarily a good thing when a parent isn’t around. That scene is in the first chapter of And By The Way. I am so glad I listened to Alex’s voice. The reaction to the Butterfly Novels has blown me away. Teenagers are so amazing. They get in contact with me every day through Facebook and twitter to let me know, not just how much they love the books, but how their lives have been affected by them in so many positive ways. I appreciate that so much. Did you have the idea planned out for a trilogy, or did it naturally progress that way? Initially, no, I did not plan a trilogy. After finishing the first book, And By The Way, I really wanted to write books from the points of view of Alex’s friends, Sarah and Rachel. When I was a teenager, I believed that everyone thought like I did. It was really only when I first fell in love, I realized that we are all so different. I wanted to show how different the same world can be from someone else’s point of view. In the first book, And By The Way, Sarah is the least likable character. I knew that some people who had loved And By The Way would want the next book to be about Alex again. It was kind of brave and maybe a bit mad to chose Sarah but that’s what I wanted to do and, as a writer, you have to be true to yourself. It was the best thing I ever did. I came to love Sarah so much and so did Butterfly fans. For many, And For Your Information is their favourite book. Do you identify with any of the characters? If the novels were to be made into a film (which they totally should 😉 ) who would you cast as Alex, Sarah and Rachel? So many of my fans have asked me if the Butterfly Novels are going to be made into a movie. So what I would LOVE is for one of my fans to, one day, make the movie. I would also love for that person to ask their casting agent to hold open auditions so that any of my fans that wanted to could audition. That is what I would love. The Butterfly Novels were an incredibly emotional series for me to read. I particularly felt moved by And For Your Information.. Is it hard to write such emotional pieces of work? When I write, I become the main character, so for me, too, it’s emotional. And For Your Information broke my heart, more than once but I fell in love with Sarah who proved to herself, to me, and to Butterfly fans just what and amazing person was hiding inside. I feel very emotionally attached to The Butterfly Novels. I find it hard, for example, to pick a favourite because choosing one over the others would be like a mother choosing a favourite child. Please tell me you’re writing something else! What’s next for you writing wise? Yes, I am editing two books at the moment. The first is a love story set in the past. I love the two main characters, Maggie and Daniel. And I have loved dropping them into history to see what happened. I am also editing a YA thriller which I am dying to get out there. I wish I could write faster. What do you hope to achieve in 2014? I would like to get both my historical love story and the YA thriller out into the world. I am very, very tempted to self-publish. I think it would be a whole new adventure. Favourite book character? Can I pick more than one? ( Oh go on then… 😉 ) Rudy- The Book Thief, Zach-Goodnight Mister Tom, Sarah-And For Your Information. Favourite place to write? That would be in Sardinia by a pool but *sigh* it is usually on my dining room table or in bed. Favourite book character that you love to hate? Miranda Priestly, The Devil Wears Prada. Hardest book to write in the Butterfly Novels series? And Actually because I’m so like Rachel. Thank you so much to Denise for taking the time to answer my questions. I’ve been fascinated by your answers. I can’t recommend The Butterfly Novels enough. Go check them out! As a celebration of the wonderful Butterfly Novels, UK readers can enter to win a signed copy of And By The Way. Sorry that it’s UK only, if you’re outside of the UK, I seriously recommend that you check out this series if you can. You won’t regret it. Click on the book image to learn more about the book! Received from the lovely Diversion books for part of the Birthday Bash Blog tour. Mina Clark is losing her mind—or maybe it’s already gone. She isn’t quite sure. Feeling displaced in her over-priced McMansion-dotted suburban world, she is grappling not only with deep debt, a mostly absent husband, and her playground-terrorizer 3-year old Emma, but also with a significant amnesia she can’t shake—a “temporary” condition now going on several years, brought on by a traumatic event she cannot remember, and which everyone around her feels is best forgotten. A routine trip to the dentist changes everything for Mina, and suddenly she’s not sure if what’s happening is real, of if she’s just now fully losing her mind… especially when she realizes the only person she thought she could trust is the one she fears the most. This latest novel by Francine LaSala (Rita Hayworth’s Shoes) is a fast-paced, richly layered, and darkly humorous satire filled with quirky characters and unforgettable moments of humanity. I heard about this book from Diversion Books. I didn’t really know a lot about it, but having enjoyed books from them in the past, coupled with an intriguing synopsis, I thought I’d give The Girl, The Gold Tooth and Everything a try. I’m glad I did, because it was an intriguing, original read. The Girl, The Gold Tooth and Everything is the first book that I’ve read of Francine LaSala’s. I would definitely read more from her. I found her writing to be incredibly accomplished and readable. I don’t want to say too much about the plot, because I don’t want to spoil it for those that haven’t read it yet. I would describe the plot as highly original, mysterious and interesting. I kept on trying to guess what was going on, but I couldn’t. I love that it wasn’t predictable. Francine LaSala has created some fantastic characters. I could easily compare some of the characters to people I know in real life! The Girl, The Gold Tooth and Everything is well worth reading, if you enjoy a magical, mysterious read. What inspired you to write The Girl, The Gold Tooth and Everything? Inspiration came from many places, including where I was in my own life (mother of young children, unemployed, hating the dentist), but like any story, you start with some raw material and then the story kind of just unravels the way it wants. Yes, I do live in a condo complex like Mina, but mine is nowhere near as lavish as where she lives. (Though my Home Owners Association may be as obnoxious as hers.) Basically I wanted to tell the story of a woman who was lost in life, and found her way again, becoming stronger than ever. I do that a lot in my stories; this is just how this particular story turned out. What do you find easier to write, fiction or non-fiction? Fiction is SO much easier! Even if I’m ghostwriting it. I suffer writing nonfiction nowadays. I get bored. But fiction just flows out of me. As an example, I just wrote a short story for a Christmas anthology called Merry Chick Lit, coming out later this month. It was nearly 9,000 words long. Not that impressive except that I wrote it in a day, and that’s with working full time (and not writing it at work, which I’m not just saying because I’m worried my bosses are listening, because even I can’t believe I did that). I also wrote the story just after completing an insufferable biography ghostwrite, which took 5 weeks. I was creatively exhausted after that and I may have backed out of writing this Christmas-themed romance had the project not been for charity. I was worried I would have nothing left in me. But not so. In fact, writing that short piece seemed to energize me. Writing fiction is definitely like breathing for me. Were you encouraged to read as a young child? Oh yes. My dad likes to read but my late mother was a real reader. She loved mysteries and quirky authors like Janet Evanovich. I definitely got that from her. I started reading when I was four. It was a book about fall leaves–funny, the things you remember. I think I spent my childhood with my nose in a book. I’m seeing that starting to happen in my older daughter and I’m also encouraging her to read as much as possible. You seem to keep really busy with many different projects! What do you see as your biggest achievement? Professionally speaking, my biggest achievement was getting my first book out there. It took more than 10 years for me to finish writing and then publish Rita Hayworth’s Shoes. I think once you get past the first one, you can do anything. It took me only months to write The Girl, the Gold Tooth & Everything, and it’s a far more complicated, involved book. But I was able to do it because I did the first one. I accomplished that and the floodgates opened for everything else. Favourite book character? Bridget Jones. I will always love her. Favourite place to write? Panera Cafe. My writer’s Mecca. A fictional character you love to hate? Bridget Jones. She makes me nuts. Today I’m joined by the lovely Rebecca Taylor who wrote the fabulous book Ascendant. Click on the picture to get to Rebecca’s own blog! What inspired you to write Ascendant? I was reading several books and watching programs on Alchemy, history, secret societies, universal powers, the power of thought and intention—and then I started seeing it everywhere, in other books by other authors (Maggie Stiefvater and Libba Bray just to name a few) and quotes and writings from famous historical figures. It felt like a fire being ignited in my brain, some great secret that certain people knew about and utilized in life. I was so excited about these concepts that I wanted to write a story about a girl discovering them for herself. Did you have the characters planned out previously or did they unfold as you were writing? Unfolded as I was writing—absolutely. I do some planning, mostly plot types of things, but the characters happen more organically as I’m writing. If Ascendant was to be made into a movie who would you like to play Charlotte? Someone unknown: dark haired, highly intelligent and quick, but slightly insecure. She has to grow into the confident young woman she will surely become. Does your job as a school psychologist influence your writing in any way? I think it helps a great deal in terms of knowing when the actions of a character don’t ring true. For me, character is king and should drive the plot. I hate when I read something and a character behaves a certain way or has a particular reaction (that is completely not something that character would do) and the only purpose is to serve the plot. Our characters should change and grow, but their behaviors and emotions should make sense in terms of whom they are and where they are heading. The wanting the writing career so bad you sometimes make yourself sick or knock yourself down an emotional flight of stairs. The bipolar swings between “I’m doing it!” and “I’m never going to do it.” Maintaining the constant and steady stream of belief in yourself that is absolutely essential—that is the number one hardest thing. Other than that, the pace at which the publishing industry moves is horrifyingly slow—being on submission is like staring at yourself in the mirror and watching your hair grow—for six months. Also, bookstores have become a psychologically interesting place for me. I have always been a reader first and foremost and so, I have always loved bookstores. I’ve even worked in a few over the years. However, when I started writing, bookstores became an emotional crapshoot for me. Sometimes, I still love to walk in and see all those books. I can’t wait to roam the shelves at my leisure and pick out what’s next for me. Other times, I walk in and I’m horrified and overwhelmed by the sheer volume of other very talented writers in the world and I wonder why on Earth do I ever even attempt to sit down and peck out some dreck. Now it’s time for some quick-fire questions! Favourite author? : Too hard. Franny Billingsley, Kate Morton, Kate DiCamillo, Jane Austen, Shakespeare, Felix J Palma, Jonathan Franzen, Fyodor Dostoyevsky, J.K. Rowling, John Green, Neil Gaiman, Meg Wolitzer, so, so, so many for so many different reasons. Favourite fictional character? : Oh God, I can’t believe I’m going to admit this but I love Sponge Bob. Most adults don’t give him a chance but I laugh just thinking of him. Favourite book genre? : I don’t have one. I read just about everything from the classics to my doctor’s office pamphlets. The only genre I don’t read much of anymore is straight up romance and that is only because I read SO MUCH of it in high school—but it’s not like I don’t ever or wouldn’t, especially if someone I knew recommend a really good one to me. My favorite books make me feel guilty because they are keeping me from doing everything else that I should be doing. Case in point: I spent the entire day on Tuesday reading the new Neil Gaiman book when I should have been writing content for my new website (and this interview.) I felt horrible the whole time—but I could not stop myself. Following reading the fantastic Aversion (review here) the lovely Kenechi Udogu answered some questions for me. What inspired you to write Aversion? I’ve always been intrigued by the idea of telepathy and mind alteration of any sort. I don’t know why but novels, TV shows and movies with parapsychological themes are amongst my favourites (maybe my subconscious is trying to tell me something). The idea for Aversion came from a random pondering session where I wondered what it would be like to possess a paranormal ability which could help others but still give them the freedom to mess up their lives. The story grew very quickly once I decided that the main character’s abilities had to be flawed in some way. Isn’t it funny how we always tend to identify with flawed heroes? Did you have the series planned out before writing the first book? Funny enough, Aversion was going to be a standalone novella but once I started to write it, all these questions started to pop into me head and I knew I wouldn’t do the story justice by keeping it in one book. If I resolved all the issues I had, it was going to turn out to be a really, really long novel (who wants that?) or split up into shorter episodes of Gemma’s adventure as an Averter. I chose to split the story to give the characters room to grow in their own time. I’m still not sure what’s going to happen at the end of the series or how long it will be. I’d much prefer the story to lead me to a natural end instead of planning it all out to the last detail. Would you like to be an Averter? No way! Messing with people’s minds sounds like way too much responsibility. I’d be haunted by the thought of failure and probably have a nervous breakdown. If you could be born with a special ability what would it be? I am obsessed with time and always wished I had the ability to freeze it or slow it down. Not all the time, just when I need a few more hours sleep or an extra half hour to meet a deadline. Turning back time would be a huge no-no though. I believe everything happens for a reason, even what we consider as bad stuff, so if we ever get evolved enough to manipulate time, time travel backwards should not be an option. Have you ever suffered from writer’s block? If so, how did you get over it? I don’t think many writers can claim to never have suffered from writer’s block. I usually leave whatever I’m struggling with and try to focus on something else. Most of the time, what I change my focus to has nothing to do with writing at all. I’d watch telly, go out with friends or play an online game. Totally distract myself from my work. It could take hours or even days, then, Eureka! Favourite author? As a child, Enid Blyton. As an adult, Stephen King. I loved Enid Blyton too! Favourite book character? Hmmmm, it’s too difficult to narrow this down to one character. I’ll pass! Favourite place to write? In bed (but I haven’t done this in ages because I tend to fall asleep with my pen still moving). A fictional character you love to hate? Sophie Kinsella’s Rebecca Bloomwood from the Shopaholic Series. I can’t stand her silliness, yet I’ve read all the books in the series. Favourite book genre? I have three favourite genres – fantasy/paranormal, thrillers and good old romance. If all of these can be found in one book …bliss! Thank you so much for your time Kenechi! Aversion is available at Amazon in paperback and on Kindle. You can visit Kenechi’s blog here! I’ve recently had the pleasure of interviewing Katie Sise, the author of The Boyfriend App, a fabulous read which is out today. You can read my review of The Boyfriend App here. What inspired you to write The Boyfriend App? The Boyfriend App was a product of many brainstorming conversations with Brenda Bowen and my agent, Dan Mandel. At first I was hesitant—I wasn’t sure that I could get the voice down of a brilliant hacker. I’m not tech savvy—I’ve only recently figured out Facebook! But when I got a few chapters in, I felt Audrey come alive. I was hooked on her. I started to feel worried about her. I needed to keep writing to find out what would happen to her life. How did you go about researching for The Boyfriend App? Are you as ‘geeky’ as Audrey is or did you have to learn lots about technology in order to write about it so well? I’m glad you think the tech aspects were well written! That was one of the hardest parts. A programmer named Jason Scalia saved me. He taught me everything. He explained it in a way that I could understand. I got to the point where I would look forward to our phone conversations because he had such a way of bringing me into this secret world of programming and hacking. It’s fascinating! Now I like to kid myself that I could be a hacker, too. But then I can’t get a file to print, and I remember I’m not Audrey! You’ve had such a varied career. What has been your proudest achievement so far? Writing The Boyfriend App for sure! I loved working as a jewelry designer and a TV host, too. But seeing the hardcover of The Boyfriend App was definitely one of my favorite career moments ever. If The Boyfriend App was made into a movie, who would you pick to play Audrey and Aidan? Favourite Place To Write: Coffee shops. It reminds me of how much writing I did in coffee shops when I was in my early twenties, and how I used to think to myself: imagine if I could get paid for this?! Favourite App: Any app that tells me where to go when I’m lost! What annoys you? : When people ride their bikes on the sidewalk and nearly crash into you! The hardest thing about writing? : Writing is so public. You have to be brave enough to put your work out there where it can get torn down. A fictional character you love to hate: Regina George from Mean Girls. Have you ever suffered from writer’s block? If so, how do you get over it? : I love to write so much, and I have limited hours per day to do it, so when it’s go-time, I’m usually pretty good about cranking out the word count I want to hit that day. But when I feel stuck, I listen to music or watch a music video or a movie trailer. Anything that reminds me how much I love the entertainment industry gets me going again. Ultimately, I want to entertain people and I feel lucky that that’s my job. So a good reminder usually does the trick. Thank you so much to Katie for answering my questions! It’s been a pleasure discussing The Boyfriend App! I’d highly recommend reading The Boyfriend App. It’s such a fun read. If you buy The Boyfriend App, email your receipt to theBFAswag@gmail.com and Katie will send you a signed bookplate to put into the book! This includes international readers!